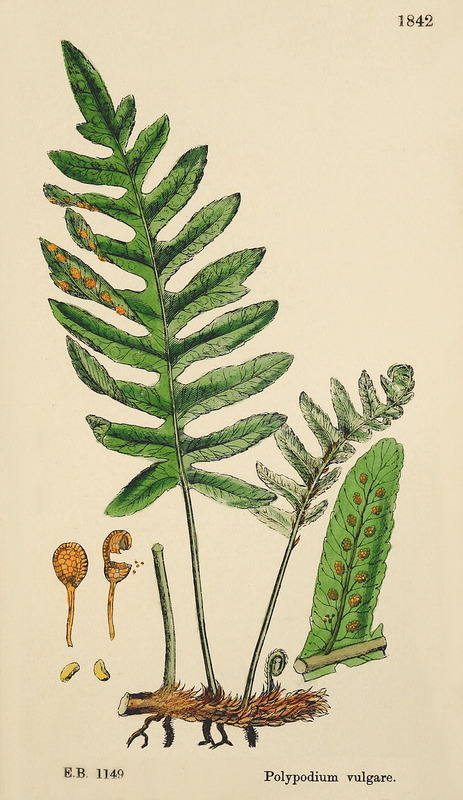 The Common Polypody (Polypodium vulgare) is a medium-sized fern that can be found in damp, shady gorges and banks in woodlands, as well as on rocks, walls and even mossy logs. They can survive dry conditions and are ideal for many gardens; in shade under trees or on walls or gravelly areas for attractive cover. They are 10 - 25 cm high with fronds that form a network of spreading, mat-like rhizomes. The fronds are single; leathery, green, erect or spreading with the blade elongated, tapering to a pointed tip, deeply cut almost to the central axis. The leaflets are almost altemate, hairiess, and margins entire or shallowly toothed, blunt-tipped and the central rachis is basically winged and leafstalk is lightly scaled near the base. Spores are produced in large, spherical, dot-like clusters on the undersides of leaflets and spore clusters are formed in 2 rows, and more abundant on upper leaflets. This is a well adapted, cosmopolitan fern of North America, Europe, Asia and North Africa, normally found on shaded ledges and crests in ravines, in calcareous or somewhat acid soils across its area of distribution.